It was an unusually cold, wet and dreary December summers day at Sandown yesterday but the result of the opening 2yo race brought a real warmth to the famous Begg racing family. The 1000m race was won on debut in sparkling fashion by Written Tycoon Colt Written By which was exciting in itself but there was a far wider story and meaning to this win for trainer Grahame Begg. The Colt was bred and is owned by Grahame's very famous father Neville Begg. The former Champion trainer now 86 is long retired but maintains his love and interest in racing through his small band of broodmares. And one could certainly sense an added level of joy in Grahame Begg's voice after the race. "My father bred this Colt and I know this win will give him immense satisfaction and enjoyment". "He took him to the Sales and there was a lot of interest in him but after not quite reaching his reserve he decided to take him home and race the Colt himself". "He still loves his racing and to breed and own a Metro debut 2yo winner will give him a great kick". Written By's dam Yau Chin was purchased by Neville Begg as a Yearling for just $2,000 and managed to win and be placed at Metro level in Sydney as a racehorse before Begg Snr retired her to Stud. She has since left the winners Take A Selfie and Il Divo both trained by his son Grahame but Begg Jnr says Written By is by far the most talented he's had out of the mare. 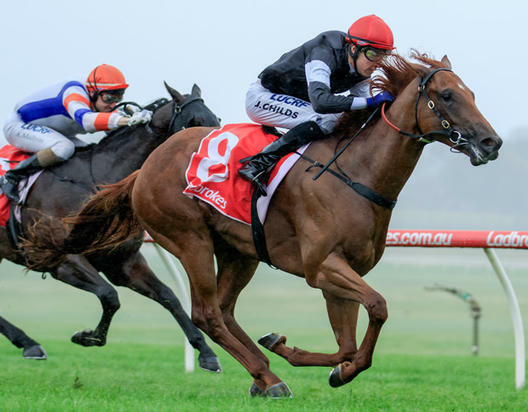 "He's shown me enormous raw talent this Colt and would have debuted at either Caulfield or Flemington during the Carnival if not for some bad Barrier manners that prevented him getting his Barrier Certificate". "So he went back to (Breaker) Shane Stockdale who got him right and we got his ticket to race in a Jump Out at Balnarring a couple of weeks back". "He's very resilient this horse because he's been through quite a bit to get here, but he's never left an Oat of feed and kept stepping up so I was happy to give him his chance". "The Wet track was a little question mark but he's a horse with a beautiful action, very light on his feet and flowing so I had a little inkling he might handle it". The story of this win didn't quite finish there! Begg Jnr got his own "added" bit of personal satisfaction with Written By being sired by the now Champion Stallion Written Tycoon who he personally selected and purchased as a Yearling before training him to win the Group 2 Todman Slipper. "I actually haven't had many (Written Tycoon's) through my stable, but I'm very chuffed with his success as a Stallion and not surprised either as he was probably the most naturally gifted galloper I've trained". "He had a wind problem which curtailed his career and if not for that I have no doubt he would have won a Group 1". Begg suggested Written By will now go for a well deserved break and will be brought back for the big 2yo races in the Autumn.